The new 266x CF Ultimate card is twice as fast as previous Ultimate cards, Kingston said. Kingston Technology has boosted the speed of its CompactFlash Ultimate cards to 266x, twice as fast as in previous Ultimate cards. The Kingston CompactFlash Ultimate cards comes in 2GB, 4GB, and 8GB sizes and have write speeds of up to 266x, which Kingston claims is "twice the minimum sustained write speed previously available in the Ultimate line". Kingston's CompactFlash Ultimate cards captures and stores images in RAW, JPEG, TIFF and other large file formats. Bundled with the cards is the MediaRecover data recovery software, which can restore lost, deleted or corrupted image files, plus a lifetime warranty. "Photographers using digital SLR cameras are looking for faster card write speeds to capture life's moments as they happen without interruption," said Mark Akoubian, Flash memory product manager at Kingston. 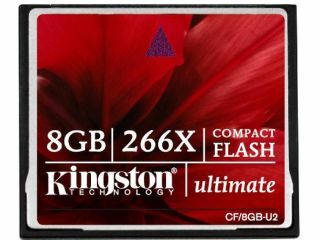 "Kingston's new CompactFlash Ultimate 266x memory cards maximizes a digital camera's performance, delivering the speed and capacity necessary to complete even the most challenging assignments," Akoubian added. There's no info on when the cards will hit UK shores but the memory cards are available in the US now. Prices are $83 (£40), $144 (£70), and $280 (£136) respectively for the 2GB, 4GB, and 8GB versions.